When Lindsey O’Connor entered the hospital for the birth of her fifth baby, she fully expected to walk out in a few days with her baby in her arms. Instead, she hemorrhaged terribly and spent the next 47 days in a medically-induced coma. This is the story of her long, long awakening—all the physical, emotional, and spiritual aspects of her ordeal. And it is a story of her incredible husband Tim and her wonderful family, friends, and church family. 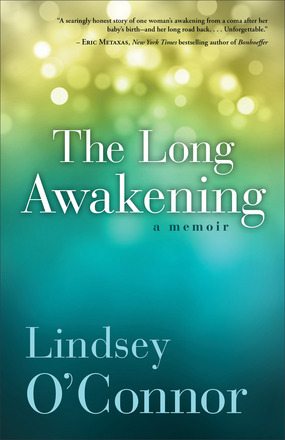 In The Long Awakening, Lindsey describes her coma, her effort to awaken, the nightmares, the pain, the hope, and the bewildering feelings. (Note: this paragraph includes spoilers.) Later on she discovers how her family reacted, how her oldest daughter stayed home from college to mother infant Caroline, how her friends cared for her family. She explores her desperation to bond with Caroline with the sinking feeling that it is already too late. She talks about the peace surrounding her, but later she wonders where God was and why she did not get to see angels while unconscious. She also discusses the wrenching disconnect between being a miracle in everyone else’s eyes and not having consciously experienced it. She listens to Tim’s story, bit by bit, because he needs to share the hell he went through during those endless weeks, and she wants to do this for him, but it is so hard. No wonder that, as she becomes physically well, she suffers from post-traumatic stress syndrome. This is the tender story of an incredible marriage as well as of a miraculous healing. However, nothing is sugar-coated. Talented journalist Lindsey O’Connor tells her story with emotion and transparency, sharing not only the physical pain, and the fear, and the hope, but also the effects of the searing emotional trauma. The Long Awakening has had me thinking for days, pondering medical blessings, commitment, family, friendship, faith, end-of-life decisions, depression, love, acceptance, and healing. Highly recommended. This is yet another book in the in the 2013 52 Books in 52 Weeks Challenge and is also linked to Saturday Reviews.